This statement and the photo of a defiant, radical, and revolutionary Mandela became part of the collective memory of a majority of South Africans and their supporters across Africa. Mandela became part of the staple diet of revolutionary stories and songs passed down by African parents to their children in the 70s and 80s. This was the Mandela who, upon his long awaited victorious walk from prison, would deliver on the declaration made in the Rivonia speech by establishing a democratic and free society with equal opportunities for all, and in which no racial group dominated another. It is the Mandela that I and many other Africans grew up with. As Nadine Gordimer, a South Africa writer and recipient of the 1991 Nobel Prize in Literature, rightly pointed out in her work entitled Living in Hope and History (1999), Mandela's imprisonment constituted a form of social entombment since it was forbidden to reproduce and disseminate even his photographs. So the only images that were left engraved in the consciousness of most South Africans were those of the revolutionary and uncompromising Mandela who spoke at Rivonia. 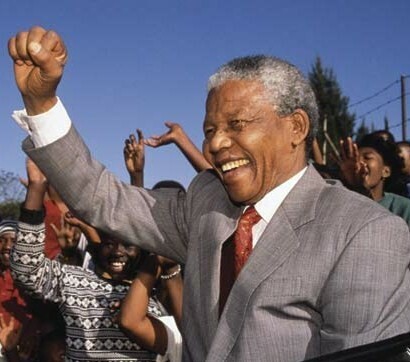 The Nelson Mandela who walked into freedom on 11 February 1990 for the first time after more than 27 years in prison did not conform to people's collective memory of him. Not only had he physically changed, it seemed that his ideas on how best to achieve the kind of society he imagined at Rinovia had also evolved. He went on to reach a compromise with the white supremacist Apartheid government. According to the deal which was then thought to be the easiest way to bring about democracy in South Africa, economic power in a post-Apartheid South Africa would remain in the hands of the white minority elite while political power would be transferred to the black majority. In return, the white elites would fully support black empowerment programmes designed to fast track the "previously disadvantaged" into senior positions in a white controlled economy. It was hoped that the benefits of this power sharing deal between a small white economic elite and a small black political elite would trickle-down to all previously disadvantaged South Africans. However, this compromise only served to perpetuate black economic oppression. Some of its failures were described by William Gumede in his interesting and meticulous book entitled Thabo Mbeki and the Battle for the Soul of the ANC (2005). To many South Africans it seemed Mandela, the revolutionary who had vowed to be always on the side of the poor, had been co-opted by capitalist forces. In order for the deal to work, a new Mandela myth which would efface or neutralise the revolutionary Mandela had to be reconstructed. South African museums, education curricula, international media, international institutions, popular culture, literature, even philosophy and theology, became construction sites of a new memory about Nelson Mandela. Through various myth-making processes, he evolved into a messianic figure and saint with a single message of reconciliation and forgiveness towards his former oppressors. Social justice or the economic rights of South Africa's oppressed black majority were no longer part of the narrative that produced the new Mandela myth. Today, almost 20 years after the "end of Apartheid", South Africa is still one of the world's most unequal societies. As the recent Marikana massacre also demonstrated, the beneficiaries of an Apartheid economic status quo who now include a small group of black elites continue to jealously protect their economic and political power while a majority of South Africans continue to live in very dehumanising conditions. While on paper a new South Africa emerged out of Apartheid with one of the most progressive constitutions in the world, it still has a very poor human rights record. This is because economic rights cannot be separated from other fundamental human rights. The poor of any society are often the most vulnerable to fall victim to human rights abuses. This year Ronald Kasrils, a founding member of the armed wing of the African National Congress and a former Minister for Intelligence Services in the post-Apartheid government, lamented that the current human rights violations in South Africa were not "the compassionate values we fought and sacrificed for." This was followed by Archbishop Emeritus Desmond Tutu who declared with a heavy heart that he would not vote for the ANC as it is today and warned that Nelson Mandela's death could finally lead to a serious and open clash between the different and opposing ideological forces in South Africa. South Africa is a ticking time bomb waiting to explode until and unless the ANC and the other political parties summon the courage to resolve the economic injustices inherited from the Apartheid era. We should not forget that in 1979 Robert Mugabe made his own deal, similar to that of Mandela, with the British government and the white supremacist Rhodesian government of Ian Smith. Just like Mandela's deal with the Apartheid government, the Lancaster House Agreement which Robert Mugabe signed ensured that economic power in a new Zimbabwe would remain in the hands of a small white elite while political power was transferred to the black majority. When South Africa finally explodes, God forbid, it will make Zimbabwe look like a Utopian paradise by comparison.